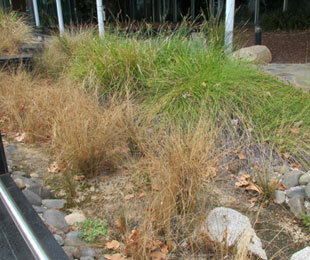 Carex & Juncus going brown reducing amount of nutrients in storm water, whilst Lomandra hystrix stays evergreen year round. 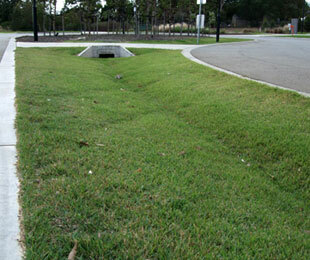 Emipre turf used in drain conditions. Rain gardens help to remove excessive nutrients from water runoff before they enter our waterways, reducing erosion and pollution. Rain gardens catch water from roofs and other hard surfaces and filter water through its layers of plant roots, sand and gravel before it travels through to the storm water system. As detailed above, you will note that Lomandra hystrix performs better when compared to other varieties, including other Lomandras. This is due to its constant evergreen characteristics, even in dry or wet conditions for most of the year. Other Lomandras have proven to go brown and straw-like, in this case the planting has failed as it can no longer filter nor perform its purpose. Lomandra hystrix varieties however stay evergreen, continuing to filter water, sand and gravel all year round. Using turf within and surrounding the water garden is another option that works well. A recent USA study found that turf produces less run off than plants. A great lawn variety for this purpose is Empire Zoysia turf, it is very low maintenance and very drought tolerant. Ozbreed has used Empire in its trial gardens as a filter for our dry river beds and it has thrived in both wet and dry conditions.